Pot-loving B.C. 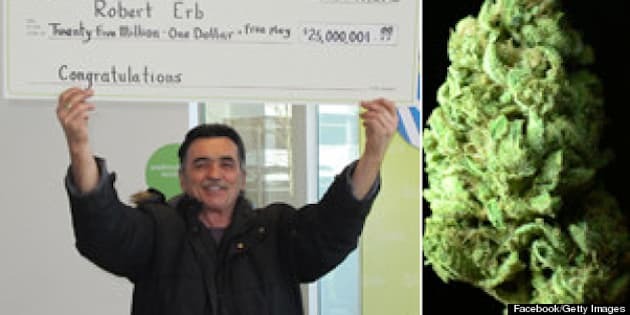 Lotto winner Bob Erb is making headlines again, this time for dropping a five-figure tip on the owner of a restaurant in Saskatchewan. Clifford Luther, owner of the Old West Express diner in Chamberlain, told CTV that Erb gave him $10,000 last week, after discovering that the business-owner's daughter had just been diagnosed with cancer. Erb left Luther a message with the cheque, telling him to be sure to visit his daughter in Vancouver. His habit isn't keeping him on the couch though. Erb told the Post he spent well over $100,000 this year to organize events celebrating marijuana's unofficial holiday, 4/20. That spending was evident as thousands gathered on Parliament Hill in Ottawa to get high and rally for the legalization of pot.